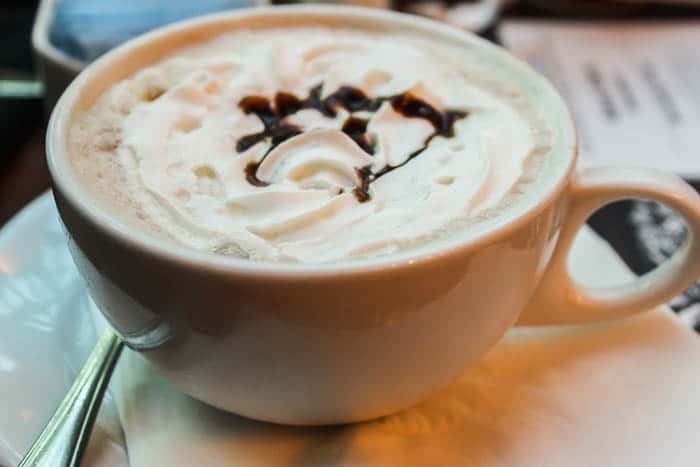 This Kona Cafe breakfast review is based on my experience when visiting the restaurant in November 2017 with my family. 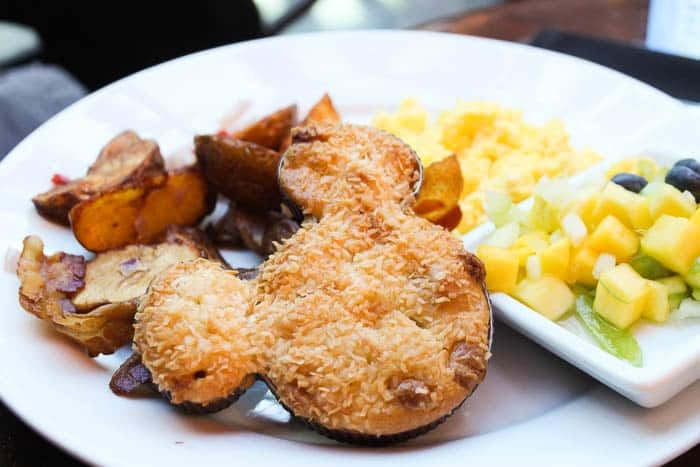 The first meal we had was breakfast at the Kona Cafe inside of Disney’s Polynesian Village Resort. The Kona Cafe is an open area restaurant on the second floor of the Polynesian Village Resort. We were greeted by a very friendly hostess and seated almost immediately. We ordered three different entrees and I realized later that Kona Cafe was the only restaurant we ate at that had some specialty coffee drinks on the menu. I enjoyed a cafe mocha and my fiance had the freshly brewed Joffrey’s Coffee® Hawaiian Kona Blend. He absolutely loved the smoothness of the coffee and bought a bag from the gift shop across from the restaurant after we ate! Before going on our trip, I had already decided that I was going to try new things wherever we ate. Instead of ordering the same old bacon and eggs, I decided to try the Tonga Toast. It’s two huge pieces of french toast that are rolled in cinnamon and sugar with bananas in between the slices. It’s served with a side of strawberry compote and you get your choice of breakfast meat as well. The flavor combination was really good! I kind of wish there were more bananas inside and I did find myself cutting away a lot of bread to get to the “good stuff,” but overall I did enjoy this, especially the bites with the cinnamon sugar! After much debate, my fiance ordered the Polynesian Egg Platter. It came with two eggs, a Mickey Mouse shaped muffin, fruit poke, home fries, and choice of breakfast meat. I always worry that he’s not going to get enough food (he eats a lot! ), but this was plenty for him! I was able to steal a bite of the muffin and it was definitely coconut and really yummy! I’ll admit, I was a little jealous I missed out on the muffin! 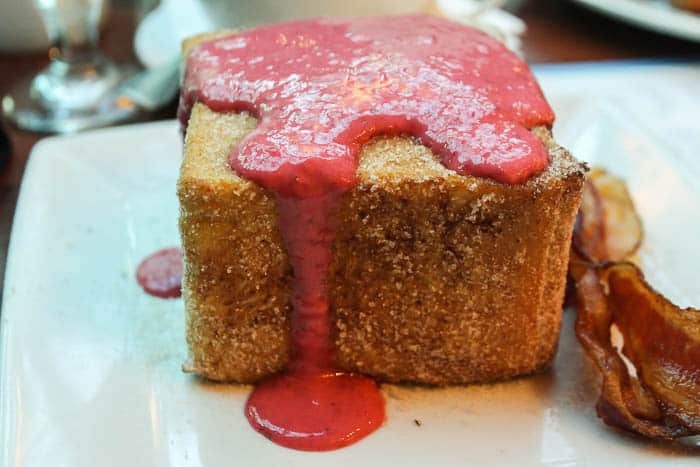 My 10-year-old ordered the french toast. I had warned him ahead of time that he may have to try new things, but breakfast was always a safe bet. 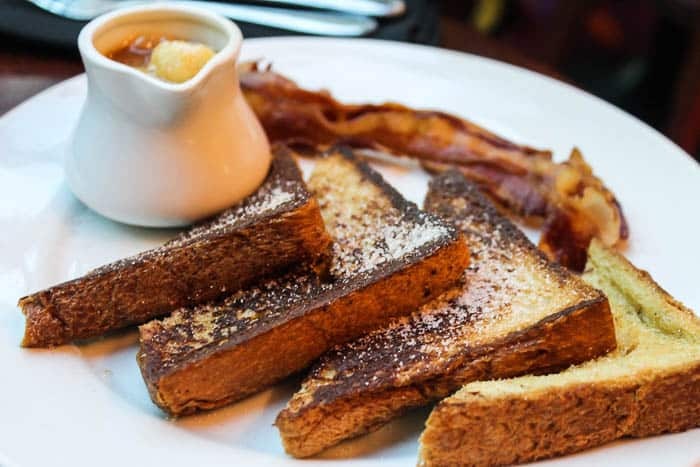 His french toast was served with a choice of breakfast meat and a side of caramel-banana sauce. While that sauce would have been right up my alley, he didn’t want to try it. Overall our experience at the Kona Cafe was wonderful! Because the menus are always changing, I can’t guarantee the same selections will all be available as in this Kona Cafe Breakfast Review. 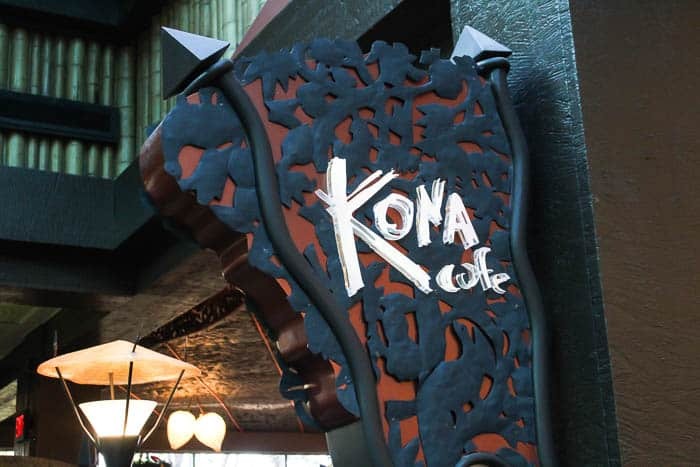 To see the current Kona Cafe menu and prices, click here!